When I wrote you the other day about our Black (& Heart of Gold) Friday Spectacular, I didn’t have a Plinko Game. At that point, I had no idea where to get one, and hadn’t really considered how I might make one. So now it’s real! 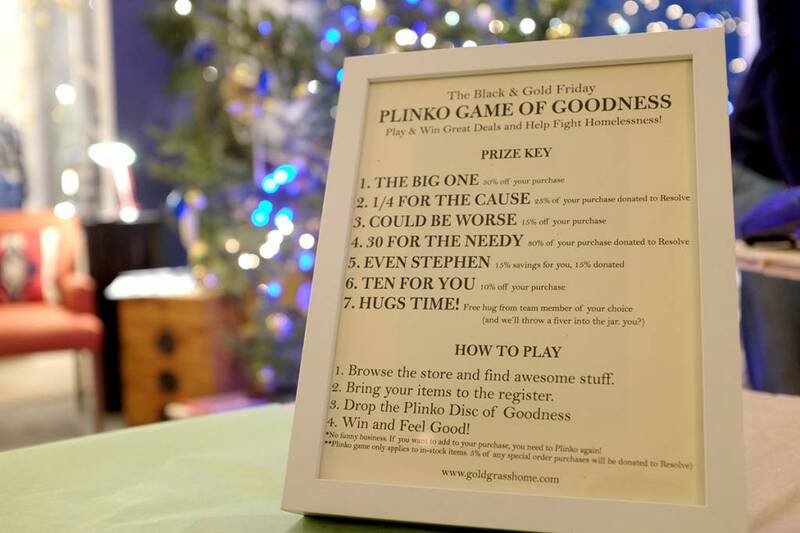 The Plinko Game of Goodness is in effect! And it’s famous! It was the feature item on CTV’s leadoff story about Black Friday on last night’s 6pm Newshour! Click Here to see the whole news segment. We show up about 20 seconds in, right after the brawl scenes. Here’s the other thing i need to confess: Due to the constraints of space and basic mathematics, odds are better than I said they would be. This goes for everything in-stock, in the whole store! Blankets, sheets, pillows. Toys, paint, ceramics, towels. And there are great deals to be had. But at it’s heart, there is also some heart. Many options on the game board result in contributions to the Resolve Campaign to end homelessness. Sometimes you win a deal, sometimes you win a donation. Sometimes we split it. Ultimately, we hope that everyone wins! The game doesn’t count for special order items, so here’s the good news. 5% of every special order, now through Sunday, will be donated to the Resolve Campaign. This means floors, tiles, countertops. Even our brand new Hastens beds! If you’ve been waiting for a reason to start that project, or if you’ve had your eye on a brand new bed for the new year, now is the time!